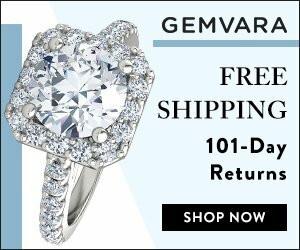 Wondering where you can find a vintage-style cluster engagement ring like the one Katy Perry just got from fiance Orlando Bloom? 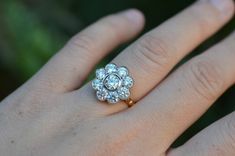 This ruby and diamond halo has a floral motif which is easy to find on sites like Etsy where vintage rings abound. 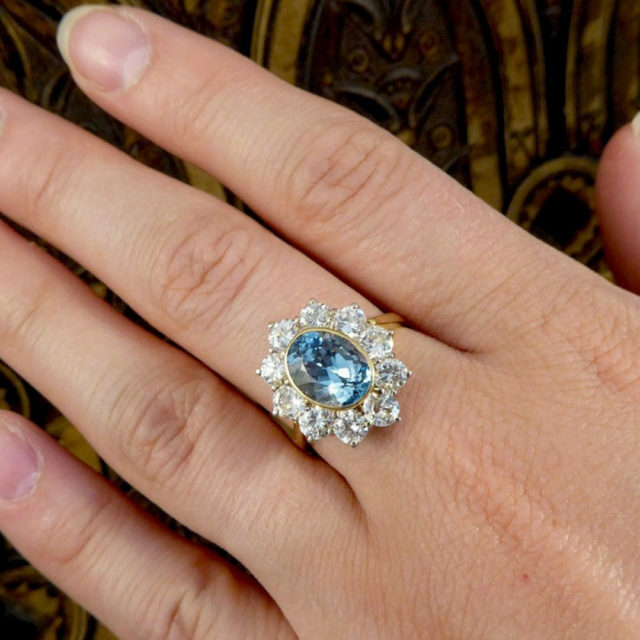 Follow along for some of my top picks which are slightly more affordable than the estimated $5 million that Katy’s ring is suspected to cost! 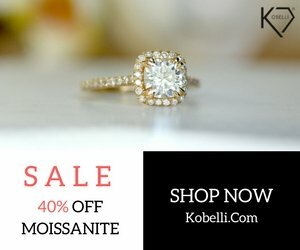 I love writing about rings on Etsy as they are so beautiful and unique. 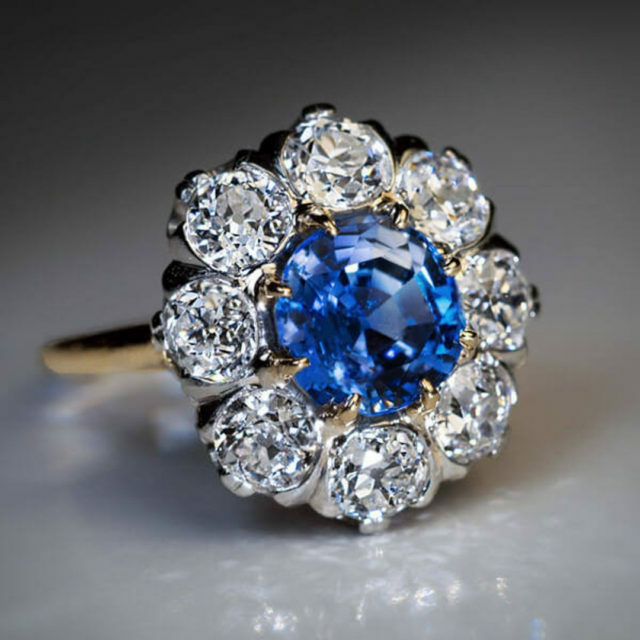 If you click through on the links below and find these styles no longer available please visit my Etsy Floral Engagement Rings list for more similar styles, or visit the sellers page for more options. And if you see something you love, don’t hesitate! The sellers I feature have top ratings from many satisfied customers so you can purchase with ease. 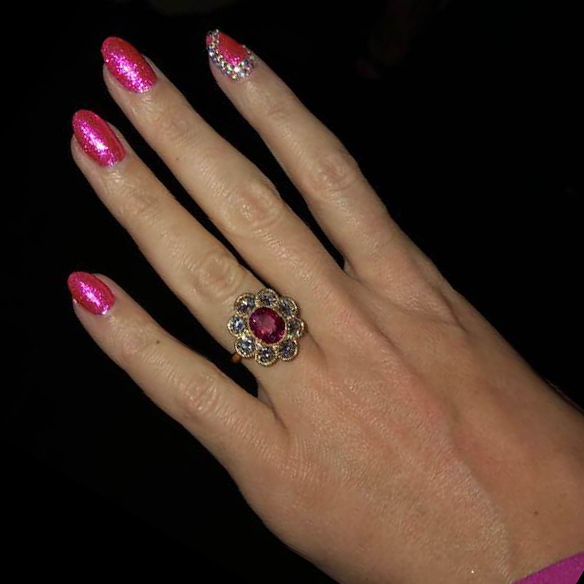 The deep pink color of Katy’s ring has Ring Voyeurs speculating whether her center stone is actually a pink diamond or a ruby. 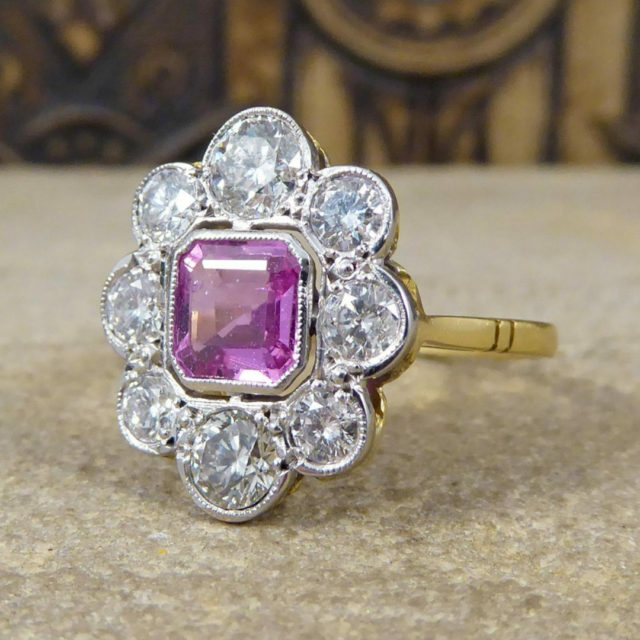 Another option, if you’re looking for a rosy pink hue to complement the floral motif of this style, would be a pink sapphire. 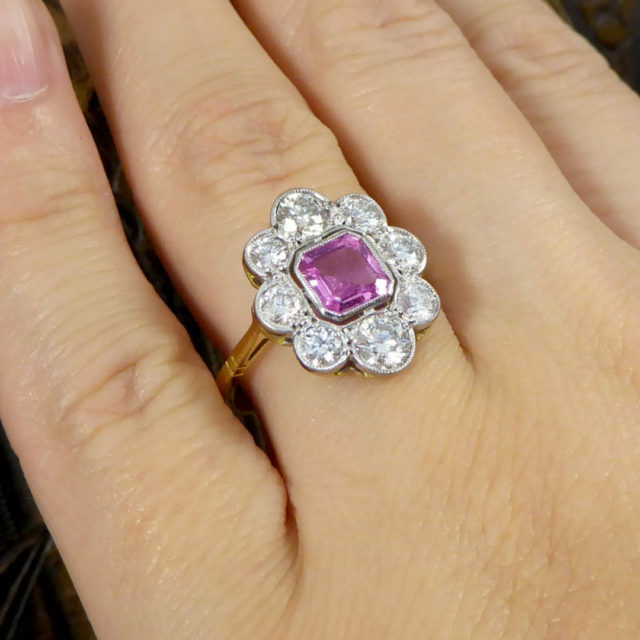 This pink sapphire and diamond cluster ring from Wharfedale Antiques on Etsy is set in 18K gold and believed to be from the 20th century. 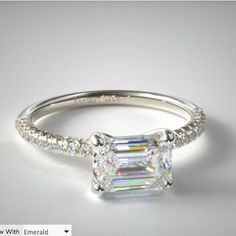 Still, the millegrain details and Asscher-cut center stone weighing in at 0.95 carats give this ring a substantial vintage feel. 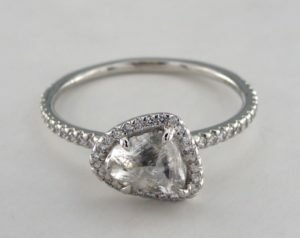 8 round modern-cut diamonds form a halo around the center stone with a total carat weight of 1.25 ct. 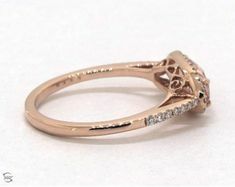 I love how substantial this ring looks on the hand while maintaining a delicate, feminine feel. 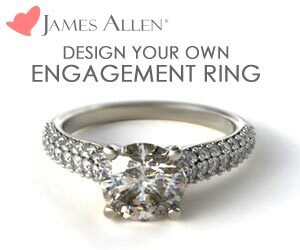 While I love my own engagement ring, I can’t help consider this one as the perfect right-hand ring. Here’s what it looks like on the hand. 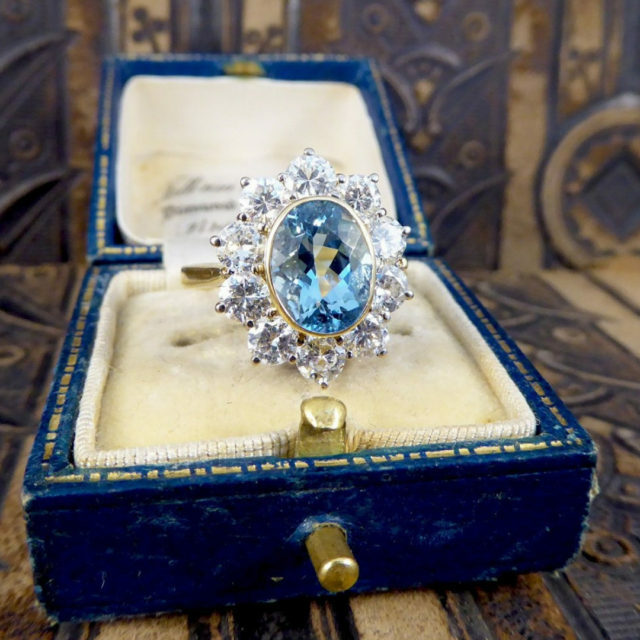 Estimated to be circa 1910, this ring is sold by RomanovRussia on Etsy based in Chicago and is one-of-a-kind, so don’t miss out. Click to see it on Etsy now. 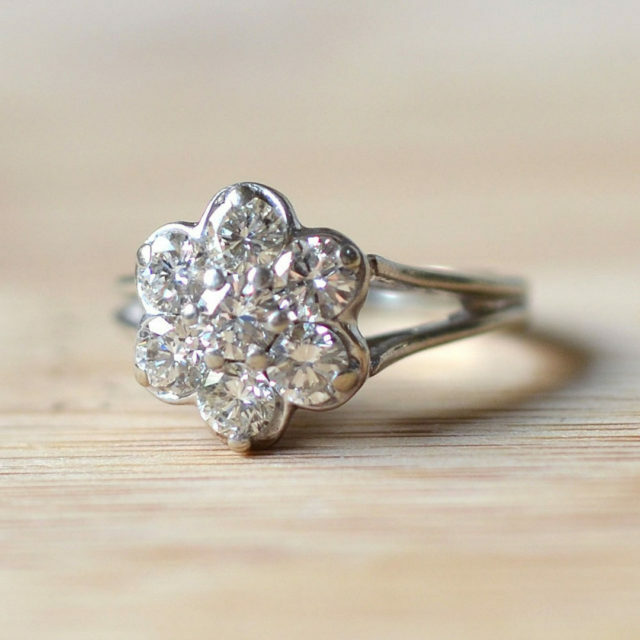 A delicate floral halo makes a great alternative engagement ring and gives you more bling for your dollar than a traditional halo setting. 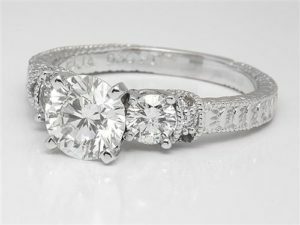 In this ring, all of the halo stones are equal in size to the center creating a star-like effect with a total carat size of 1 carat. 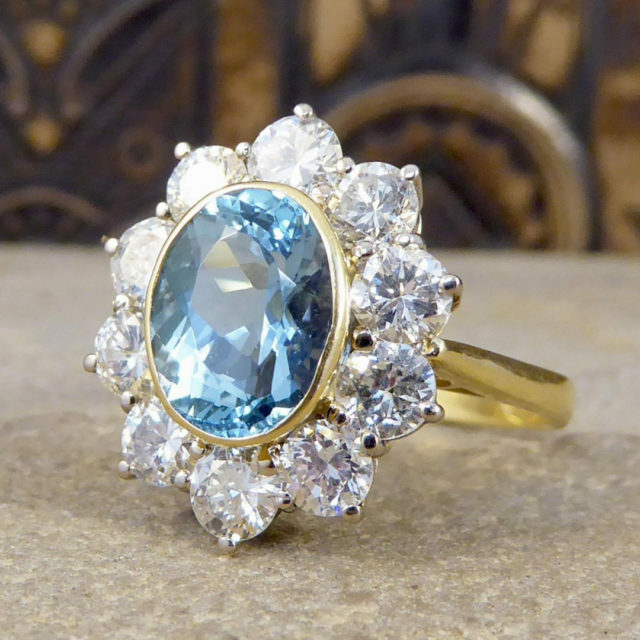 This one is sold by SolvangAntiques on Etsy, but this style is not hard to find when you search the site with keywords like Diamond Floral Halo Ring. This emerald and diamond ring set in platinum is believed to be from around 1925. The octagonal shaped emerald is set in a platinum bezel and is estimated to be 0.8 carats. 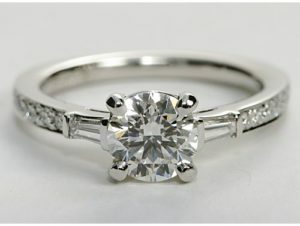 The fine millegrain detailing on the setting accentuates the 12 round diamonds which total about 0.85 carats. Sold by Karen Deakin Antiques on Etsy who is extremely knowledgeable based in Sydney, Australia. 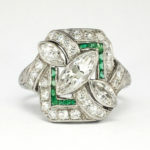 Check out this reverse emerald cluster ring as well. I can’t decide which one I love more. 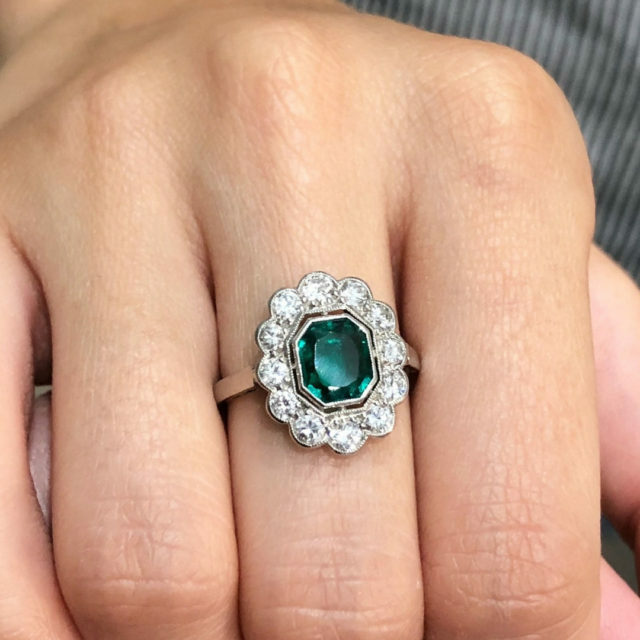 Watch the video to see this Art Deco Emerald Diamond Ring in action! 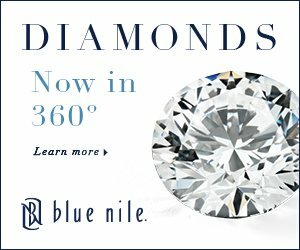 This contemporary setting has vintage appeal with a yellow gold bezel-set 2.35 carat oval aquamarine surrounded by 10 diamonds with a combined weight of 2.15ct. Sold by Wharfdale Antiques in Leeds, United Kingdom – who I seriously suggest checking out to see more of their brilliant treasures. This piece ships free to the United States. If you love it, go for it. I’m sure it won’t last. See it in box and on finger below.